A video-conference with the Community of Practice at the University of Tasmania, Hobart, April 22, 2015, chaired by Colin Clark, Head of University Careers, Disability and Counselling and the Student Centre at UTas. As the student cohort continues to diversify, the push for increased internationalisation and cultural literacy within the University community also grows. The impact of this trend on the wider Tasmanian community is also of note and the University is a significant stakeholder in promoting cultural understanding, care and engagement. Central to any cultural understanding and inclusion is the awareness of religious and spiritual beliefs and the associated pastoral care this entails. The University identifies clearly as a secular organisation but welcomes religious and spiritual representative chaplains on campus. These are volunteer roles, usually on top of an existing University staff role or other full time role in the wider community. The University does not have an integrated or acknowledged spiritual and pastoral care vision or direction. While the Representative Chaplains facilitate a number of very positive programs and interventions, these are not coordinated across the University and the concept of a multi faith environment on campus is not clearly identified or promoted. 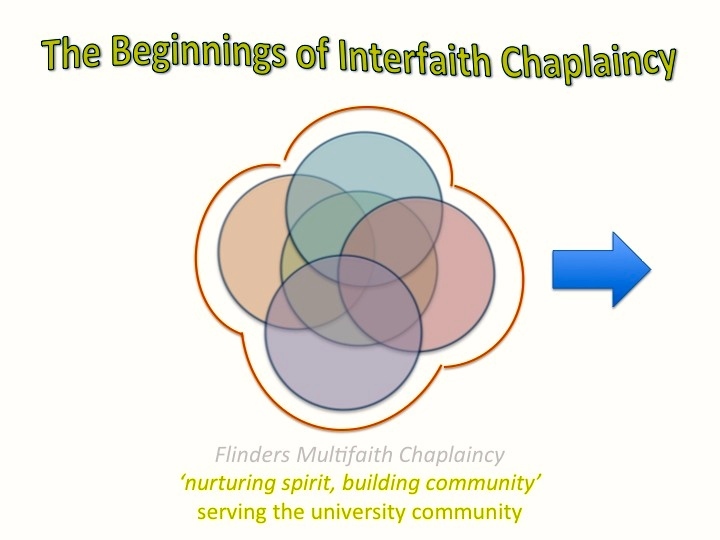 An opportunity exists in conjunction with the national Spiritual Care Australia conference held in Hobart, for the Coordinating Chaplain from Flinders University to discuss how spiritual and pastoral care in a multi faith environment on campus has been developed over the last two decades. Mr Geoff Boyce is the founder of the Oasis Centre at Flinders, which incorporates a range of issues encompassing social inclusion – hospitality, welcoming, mentoring, peer engagement, social networking and volunteering. Underpinning these activities is a cultural diversity in which spiritual practice and belief is respected and enriched. Geoff has offered to facilitate a session at UTAS, outlining his journey of development with the Oasis centre and initiating a discussion with interested stakeholders across the University around engaging with internationalisation, inclusion and equity through spiritual and pastoral care and a multi faith perspective. The session will be run via video conferencing on Wednesday, April 22 from 1.30pm – 3pm. In addressing the themes raised in the brief, I am present today as a member of staff of the university. I am not here to talk about religion per se, but as a fellow traveller with others in universities continually figuring out how best to respond to ever-changing realities in our situations. Put another way, I am not here to make any argument for religion as such. But I think it is self-evident that we are at a point in history where we must take notice of it. How we may address religious pluralism in a secular institution in the context of a commitment to inclusion is at the heart of the Oasis project; and is the subject of the conversation-starter we offer today. My colleague, Alan Larkin has been one of a number of mentors in the development of Oasis over the last ten years and is now an active member of the Oasis Team on campus. Alan was formerly the Director of the Flinders University Institute of International Education. He has spent considerable time in Indonesia and the Philippines consulting with government officials in the development of education in those countries. His focus at Flinders before his retirement has been postgraduate programs in leadership, management and strategic planning. I have been a secondary school teacher for 25 years, always interested in innovation and the welfare of students, falling into university chaplaincy in my “retirement”. I intend to begin by sharing some backgroud on why Oasis developed the way it has at Flinders. It has been a seventeen-year evolution, and only in the last two years within the administrative structures of the University. Then Alan will comment on critical aspects of the emergence of Oasis and its significance in the tertiary sector, coming at it from the perspective of a life-time of engagement in leadership and management, firstly in the private sector, then as an Educational Consultant in Secondary Schools and finally as an academic within the Flinders School of Education. The student experience, beyond curriculum, is a critical component of university life and a determinant of student demand. We aspire to provide an equitable and inclusive environment for our students, valuing diversity and encouraging respect, fairness and justice. I was struck by an aside of a person being interviewed on Radio National last Saturday morning about an innovative approach to providing social services. The aside was about a little church community in Melbourne, which had developed a breakfast program for homeless men in their locale. Apparently the group must have been relying on government funding because they had ‘lost their tender’; and now a large social welfare NGO had taken on the job. But the comment that struck me was this – under the new regime with the NGO the hungry were still fed – but now there was no-one to sit down alongside the men to listen to them. I once heard a visiting Professor of Psychiatry from Harvard discussing how he understood spirituality. He put up on the screen the words of the prayer attributed to St Francis of Assisi – ‘Make me a channel of your peace…’ He had highlighted the key end-words – peace, hope, love, faith, pardon… These he described as ‘positive emotions’. And if they are emotions, he said, neuroscience places them in the limbic area of the brain. They are hard-wired in all human persons. ‘Spiritual Care’ relates to the nurture of these ‘positive emotions’. On the other hand, he said, religion is a construct. So it is found in the cognitive part of the brain. Religion consists of those practices intended to foster positive spirituality. These practices are not innate – religion is learnt cognitively. I have recently been in contact with a distinguished neuroscientist at Flinders and he tells me that the brain is much more complicated than that and continues to be mysterious! Nevertheless, I think it is a useful, if tentative, thought – that the human person is innately spiritual, but religions are constructed and vary from culture to culture. In this sense, Oasis represents a move to foster spirituality in a secular institution, while still recognizing and affirming the role of religion and culture. We know that international students bring their religion with them. We know that recognition of their culture and the opportunity for them to practice their religion is important to them. We also know that many international students miss the cultural contexts of their religion, particularly the religiously based cultural festivals, such as Eid or Diwali, when whole communities, regardless of individual beliefs, celebrate together. If we were to recruit globally, we might expect our students to bring with them all of these belief systems and more. 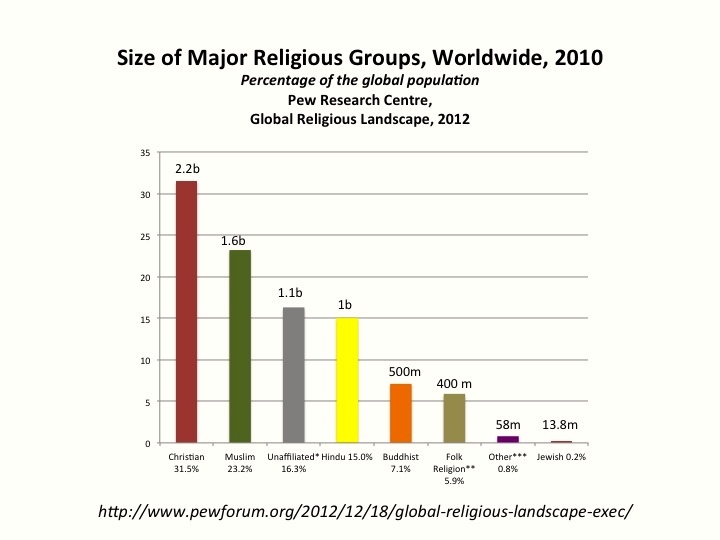 We would expect that a globally recruited intake of students would reflect a diversity of religious belief as if we had taken a slice through the graph – it would reflect the explosion of Christianity in Africa and Asia; the Muslim consensus of countries in the Middle East and Indonesia; the ‘unaffiliated’ masses of China; Hindu India; Buddhist Asia – these are massive populations – as well as indigenous, pagan and animist cultures. What we end up with is a diversity of faiths. And each of these has its own diversity! A picture of our globally recruited intake of students might look similar to a picture of immigration to Australia. The way we have included migrants of diverse cultures has been to see Australia as a multi-cultural (literally, many cultures) country and to encourage the celebration of that diversity and respect between the different ethnic groups. Harmony between faiths is much more challenging! 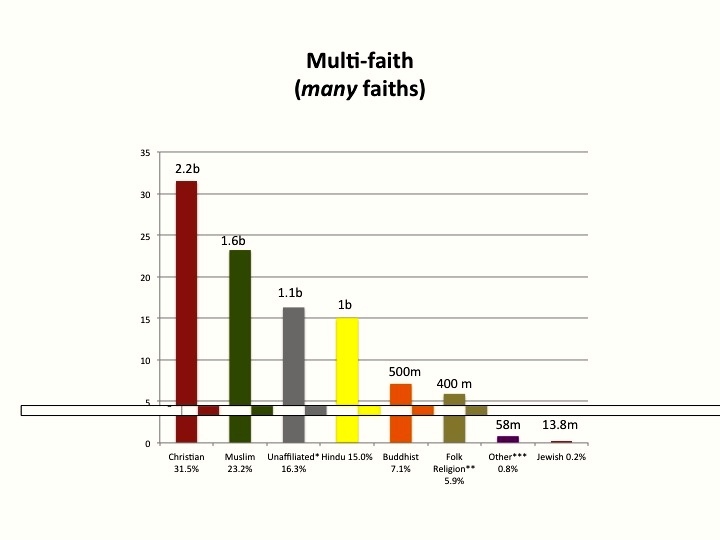 Interfaith (literally between faiths) relates to the additional input, beyond multifaith, to foster a culture of peace and harmony in a pluralist social setting. Interfaith goes beyond recognition and respect for the rights of other faiths – it says that we are all in the same boat, so we have to learn how to row together for the sake of an agreed goal – a peaceful, civil society. But isn’t the university secular? The history of South Australian settlement indicates that ‘secular’ cannot equate to ‘a-religious’. Many of the early colonisers were ‘religious’ – ‘dissenters’ escaping oppression by the established Church of England (the church hand-in-glove with the state) or religious persecution elsewhere. They were insistent on a secular state to avoid a repeat of abusive religious power in the new utopian colony. Yet they built twenty-five churches in the square mile of Adelaide – the ‘City of Churches’! The secular state guaranteed them religious freedom, not the abandonment of it. Faced with the reality that everyone on campus has beliefs of some kind, and many of these religious, I think we have to re-examine what we mean by ‘secular’. I think it is unrealistic to assume that everyone may be treated as if religiously neutral. We get some clues about this when we talk with Australian Aboriginal people. To reduce their human person to the material, as if there is no spiritual, is to deny their humanity. I don’t see how I might understand my Aboriginal friends without engaging with their spirituality. ‘Secular’ does not mean ‘a-religious’. But I think in our situation it could mean that no one religion be privileged over another by the institution. 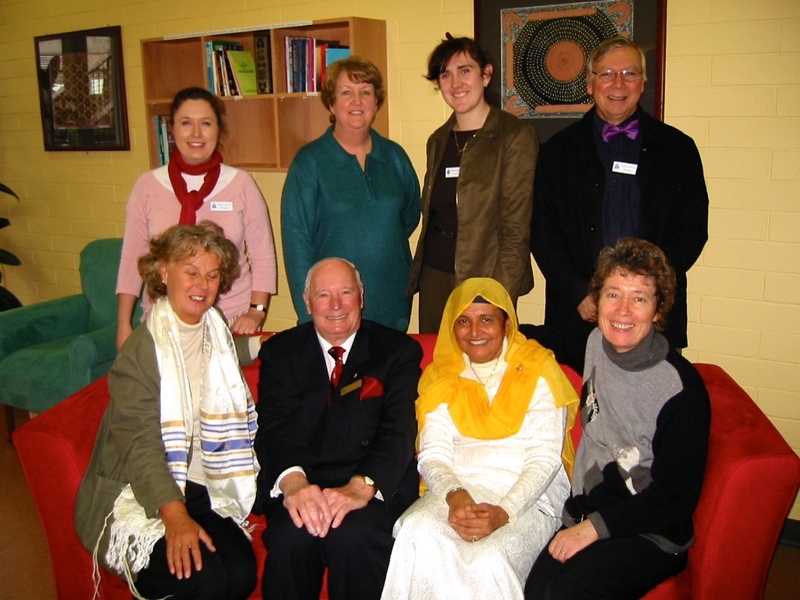 The seeds of Oasis at Flinders were sown in 1997 when the Christian chaplains accepted the reality and validity of ‘multi-faith’ and began to invite student societies, clubs and associations of minority religions into the Religious Centre, which had, since its inception in 1968, been ‘mono-faith’. As a result, minority faiths were invited to appoint their own chaplains. 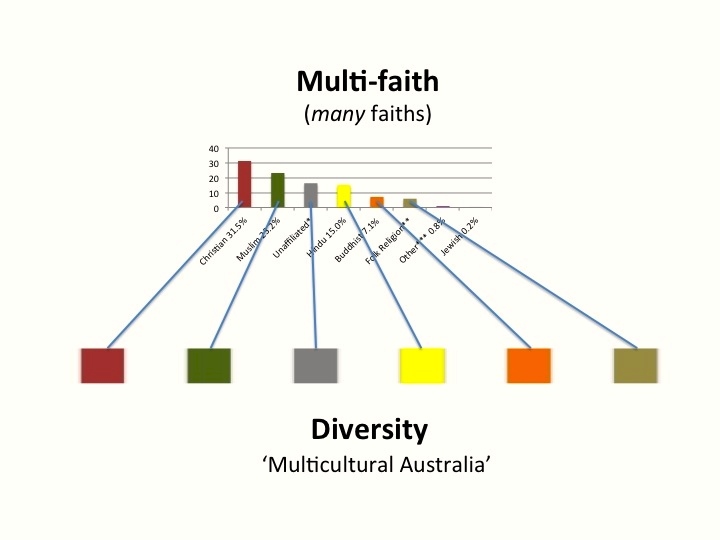 By 2005, Flinders had achieved a multifaith chaplaincy, with every major world religion represented, on campus, or by association. On this journey, we met weekly for lunch together. We rarely talked about religion. But as we got to know each other, friendship blossomed and we began to support each other in our various activities. I remember walking with others behind a banner created by my Buddhist colleague, Thay, drawing attention to the killing of Buddhist monks in Myanmar. For me, this was not just a concern for Buddhists. A young nursing student approached me at one stage. She was obviously very moved by this procession. She told me that she was from Myanmar, that she didn’t think anyone in Australia knew about the plight of her country, and she didn’t know anyone else at Flinders from her homeland. At the conclusion of the procession, I introduced her to Thay, who follows the Vietnamese Buddhist tradition. Nevertheless, he spent time listening to and affirming her and gave her a Buddhist blessing from her tradition. She went away affirmed, her spirits lifted and now feeling cared for, not just as a student but more deeply for who she was, and more connected to the university. Looking back, these collaborative actions signaled the beginning of a move from multifaith, where we respected each other and didn’t try to change each other, to interfaith in action, each working together for a common cause, yet each partner retaining their identity and bringing the gifts of that identity to the cause – serving the whole university community in agreement with the rubric decided on together: nurturing spirit, building community. The practice that enlivened this move was the practice of hospitality, the creation of space not to change the other, but to allow the other to explore their own changes. This consensus on a common rubric, enlivened by hospitality, would find tangible expression in the conception of Oasis – a metaphor for openness and inclusion, holding promise beyond the former ‘Religious Centre’, which, at best, could only be multi-faith, a vision not radical enough to avoid future conflict between faiths in challenging new situations. Following the Global Financial Crisis of 2007/8 and other financial demands on the major church denominations, a number of churches withdrew funding for university chaplaincy. In late 2012 it looked like Oasis might collapse. However, the re-introduction of student fees that year enabled the University to take the initiative to draw Oasis into its administrative structure and fund two full-time staff to continue to develop Oasis – an Oasis Coordinating Chaplain to hold together a team of volunteers, and an Oasis Administrative Officer to manage the centre. The support of religious communities to appoint chaplains to Oasis was still sought, but under the condition that such chaplains commit to advancing the vision of Oasis and that they be equal members of the Oasis Team. Administratively, Oasis was placed within Student Services under the line-management of the Head of Health, Counselling and Disability Services. However, Oasis continued to be connected with a number of inter-related constituencies – students, staff (university services, schools and departments) and the wider community. Connection with staff was vital if Oasis was to have a university-wide mandate; connection with the wider community, if Oasis was to continue to draw on volunteers from the community and share its ‘research’ more widely. responsive to the Flinders and wider community. Building personal welcoming, networking and hospitality functions into the position description of the Oasis Administrative Officer, complementing the administrative functions of managing the Oasis centre. Personalising the centre cultivates a culture of care, distinguishing it from other non-personalised spaces. Establishing the Oasis Team as an inclusive team comprising those who are committed to the vision of Oasis and its values; the Team may include chaplains appointed by religious communities on the same basis as other team members. The team is a mix of ‘professionals’ and ‘amateurs’ – each drawing on the strengths, the skills and experience, of the other. Establishing that all activities within the Oasis centre are expected to be inclusive; religious clubs and societies to fall within the aegis of the Flinders University Students Association; and worship activities the province of places of worship in the local community. i.e. Oasis focuses on the ‘inter’, building respectful and caring relationships between people of difference. Encouraging the emergence of Oasis as a drop-in, community centre, where interchange among students and their empowerment, in keeping with the ethos of Oasis, is encouraged. Staff initiatives in keeping with the ethos of Oasis are encouraged and supported. Retaining a small, agile, innovative, complementary role, collaborating with other university agencies to value-add to the university, rather than allowing Oasis to grow into another ‘silo’. Insisting on informal, hospitable, non-commercial, voluntary parameters and resisting ‘rescuing’ or encroachment on the legitimate roles of other agencies or staff of the university. This entry was posted in Uncategorized on May 6, 2015 by Geoff Boyce.